Vote Early at the Glover Sudduth Center! 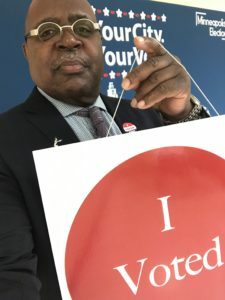 Early voting at the Minneapolis Urban League’s Glover Sudduth Center started today, October 30! Our lobby keeps filling up with people eager to file their ballots on this first day of early voting. Early weekday voting is open from 7:00 am to 6:00 pm. On Saturday, vote early from 9:00 am – 4:00 pm; and on Sunday, vote early from 12:00 noon to 5:00 pm. The last day to vote early in person is Monday, November 5, from 7:00 am to 5:00 pm.